Chocolate, caramels and walnuts - how can you go wrong with a recipe that combines these three ingredients? 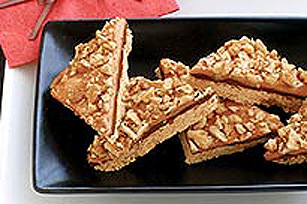 You won't be disappointed by these Chocolate Caramel Nut Bars - they're easy and delicious! Preheat oven to 350°F. Line 15x10x3/4-inch baking pan with foil. with ends of foil extending over sides of pan; set aside. Beat butter and sugar in large bowl with electric mixer on medium speed until light and fluffy. Add flour; beat on low speed until mixture is well blended and crumbly. Press dough firmly into prepared pan. Bake 15 to 17 minutes or until edges are golden brown. Remove from oven. Sprinkle with chocolate; cover with foil. Let stand 5 minutes or until chocolate is melted. Spread evenly over crust. Microwave caramels and cream in microwaveable bowl on MEDIUM 4 minutes or until caramels begin to melt. Stir until caramels are completely melted. Spread evenly over chocolate layer; sprinkle with walnuts. Cool on pan on wire rack. Remove dessert from pan, using foil handles. Cut into 18 bars, then cut each bar diagonally in half to form 2 triangles.